The original Betty potstickers used pork and had a different filling; our version is kinder to the little oinkers. Cute little intelligent pigs who want nothing more than to just chill out in some grass or mud if it's hot out--or maybe swim around in The Bahamas. I mean I don't actually speak for pigs or anything - they unfortunately don't have elected representation at the moment - but I'm pretty confident when I say I'm sure they would rather be doing pretty much anything than being potstickers. You might also start looking through this recipe and think "Wow, that's a lot of steps. What can I skip over to make this go faster?" Sorry to have to be the one to break this to you, but you have to follow all the steps. There are no shortcuts to Mordor, or potstickers. I'm not trying to be mean, but all the steps are pretty key. It should make you feel better to know they actually go very quickly. But that thought might lead you to another : "Hmmm. It is a lot of steps... is this worth it?" To that question I only have one thing to say to that lazy negative voice that would deny you tempeh postickers. "Hell yes! Now go boil some water." I should warn you though, this recipe makes a lot. It would be perfect for a party or potluck - especially since you serve them at room temperature or chilled and aren't terribly expensive for how cool they are. So basically this recipe makes a ton (not literally) of cheap but delicious vegan food. Yeah. It's that good. Are you ready to wok? In a large bowl, mix all the Filling ingredients with a large spoon. In another large bowl, mix Whole Wheat Flour, All-purpose Flour and Boiling Water with a hand held mixer. Once the mix makes small pebbles and cools a little bit, use your hands to knead the dough into one large ball. Knead your dough for 5 minutes to make sure it is completely blended. The dough will be warm while you do this. Divide your dough into 4 equal segments. Roll each of those segments into 12 inch long ropes. You want them to be evenly rolled like a cigar. You don't want "tails" at the end like Jabba the Hut. I mean I find as a good rule of thumb - if your food looks anything like Jabba the Hut - something has gone wrong. How slice each of these ropes into 24 pieces that about 1/2 inch thick. They will look like little marshmallows. One at a time, form each piece of dough into small rounded pancakes shapes. You want to keep them a little smaller than your palm. Gently fill them with about 1 teaspoon of Filling and then fold over the dough and pinch the edges together to seal them. You want them to be seamless and smooth but with a slight rolled/pleated edge. They will make small little pockets that look a lot like oyster shells. Place them on a plate once they are sealed seam up. Gently press them onto the plate to make a flat bottom. Set up your steamer. Now we used a traditional Chinese bamboo steamer that fit over a pot of boiling water and on a side note make your home smell really amazing when you use them. Terrible photo but it does show what we're talking about. I know a lot of you have fancy electric steamers and will need to read your instruction manuals before starting this part. You want to follow the instructions that will keep your dumplings from getting wet. Most electric steamers have baskets or racks to do this. It's important they are raised above the water. Heat your wok at a high heat. Add Sesame Oil to the Wok 2 tablespoons at a time and then place about 10 potsticker dumplings into the wok with the flat surface down in a single layer. Fry for 2 minutes or until the bottom is a golden brown. 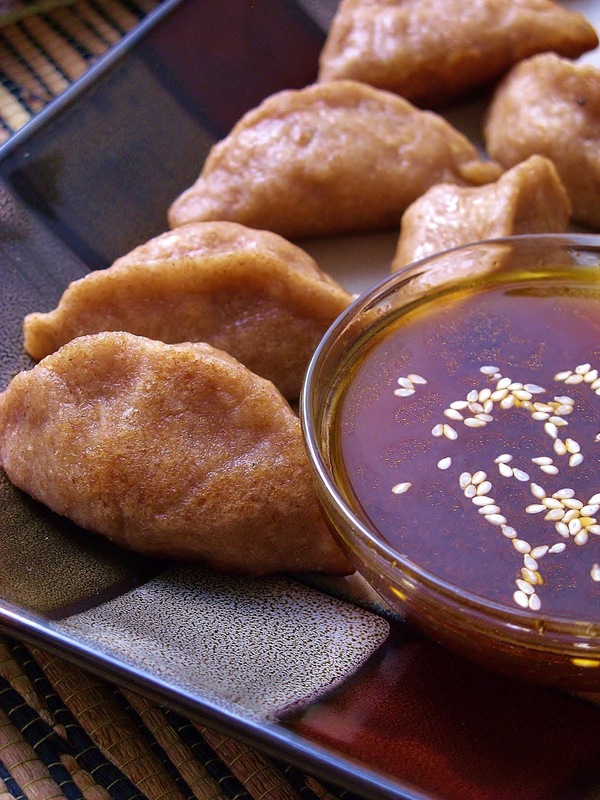 Move your fried dumplings into the steamer and steam for 5-7 minutes or until the dough feels solid. You're going to be doing this batches for about 20 minutes and you'll want to keep an eye on your steamer and wok because the longer you cook the hotter everything gets and the faster the dumplings cook. Once they are solid, place the dumplings on a plate and set aside. You're going to serve them at room temperature so don't worry about keeping them warm. If you prefer them chilled place in the fridge. To make your dipping sauce, mix all the Sauce ingredients except Sesame Seeds until the Agave Nectar melts into the liquid.After you pour the Sauce into a small serving bowl or ramekin, sprinkle with Sesame Seeds. 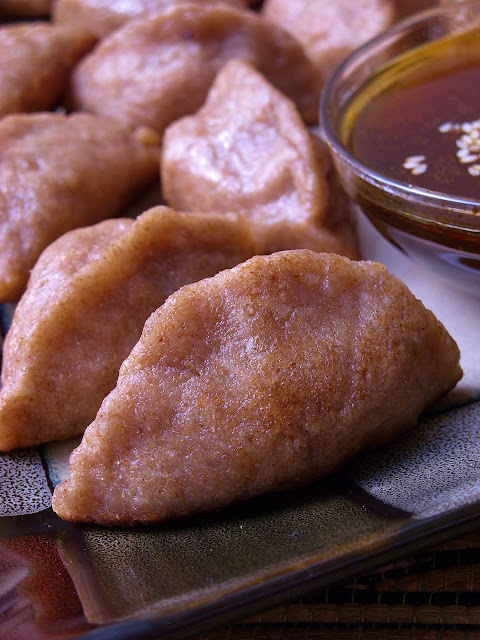 Serve once all the dumplings are cool on a platter with the sauce and eat with your fingers. Swimming pigs?! Never saw that before! Ad your potstickers look delicious! I will have to make some time and make a batch soon. Do you think you could freeze them, either pre or post steaming? I have to admit I have wasted many an hour watching those beach pigs. So freaking cute. What about using pre-made wonton wrappers? I love that link! Thanks for sharing it!